The Elders can be found in the strangest of places and this is particularly so of those who inhabit the dungeons across Azeroth. While Where Are the Elders details the location of the Elders in the Eastern Kingdoms and Kalimdor , Newly Remembered Elders of the Cataclsym gives the location of those in 80+ areas and Honoring Our Elders covers the quests and achievements related to the Lunar Festival, here I will give the locations of the Elders in Northrend and the Dungons. Thirteen elders are found inside – sometimes near the entrance but often deep inside – instances across the continents of Azeroth. They can be accessed by the dungoeon finder at the appropriate level, by a pre-made group or can be easily soloed by higher level toons. The actual entry requirements to dungoens are lower than those required by the dungeon finder. Meeting stone no longer have level requirements and with Cataclysm all dungeons (not just Northrend dungeons) have an in-game map with bosses marked to help you navigate your way around them. Six elders are in classic dungeons – two in Kalimdor and four in the Eastern Kingdoms. These dungeons range in level from the 40s up to 60. In virtually all cases boss encounters are not required to reach the elders (possible exception being the Ring of Law event in Blackrock Depths which takes some time to start, if you are quick you can avoid it). In other words, if you can solo the trash in the dungeon you should be able to solo access to the Elder. A. Maraudon Pristine Waters (level 43-53) – Elder Splitrock is in the final part – up the ramp from the Rottgut’s area. To get there – follow the stairways from the door down, go through the central archway between the Orange and Purple entrances, follow the spiral pathway down until you reach a shrine and go through the portal (the Sceptre of Celebras is no longer needed to access this portal). This takes you to the top of the Earth Song Falls. Jump down into the water; go straight till you find an entrance flanked by two large flowerlike plants. Follow the ramp/passageway up until you reach the area of the Princess, you can either take the lower stone bridge across the Zaetar’s Grave area and continue to the left or jump into the water, swim past Rottgut (the large crocodile boss) under the archway, then go up the ramp till you find the Elder. As far as I know, there is no exit from the final section of Maraudon so you will need to hearth out. The entrance to Maraudon is on the southern end of the Valley of Spears, in southwestern Desolace. B. Zul Furrak (level 46-49) – Elder Wildmane is in the courtyard with the pool (on the northeast side). The entrance to Zul Furrak is in the northwest corner of Tanaris. C. The Sunken Temple – Elder Starsong is behind a group of dragonkin at the back of the closed off entrance on the first left from the dungeon entrance. The entrance to the Temple of Atal Hakkar is in the middle of the Pool of Tears, in the western part of the Swamp of Sorrows. The instance has been radically simplified with the Cataclysm expansion with the removal of all but one of the maze of rooms between the water filled Broken Hall and the instance entrance and all levels except the dragonkin one with the main bosses. D. Blackrock Depths – Elder Moondeep is in the Ring of Law (just past the Detention Block area). Entering the Ring of Law will start the Ring of Law sequence though it is possible to leave before the gates shut if you are quick enough. To reach Blackrock Depths you enter Black Mountain (either the lower entrance from Burning Steppes or the higher entrance from Searing Gorge) and carefully run down the chain to the central hub, go down past the tomb, and then run down the second chain, through the door on your right, and through the quarry area, keeping to the left side. It is now possible to fly directly across the lava to the entrance into the quarry area. E. Blackrock Spire – Elder Stonefort is just past and to the right of the first wooden bridge, in Hordemar City, lower Blackrock Spire. The entrance to the Spire is also in Black Mountain. It is possible to run up the chain, jump down and run along the rock ledge to the right, jump across to the balcony or, if possible, just fly straight on to the balcony. F. Stratholme (not to be confused with the Culling of Stratholme) – Elder Farwhisper is in Festival Lane. Since Cat there is no longer an easy path to him from the Service Entrance. From the main entrance go right at King’s Square, through the double gated archway on the right into Festival Lane, then hug the wall on the left, following the inner curve around the buildings to where the Elder is standing on the other side (just before the archway to Market Row with the ghosts and the Unforgiven One). It is also possible to go left following the curve of King’s square around to the trapped gateway and continuing through to Market Row until going through the ghost ambush gateway into Festival Lane. The Key to the City is no longer required to exit Stratholme. The main entrance to Stratholme is in the northwest corner of Eastern Plague Lands. Seven of the Dungeon Elders are in Northrend instances (both Heroic and normal modes). 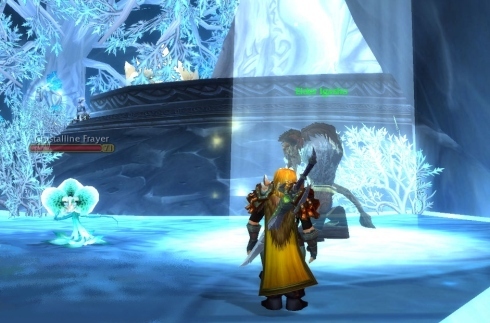 The dungeon finder for the majority of the Northrend instances require at least level 70 (normal mode) while the Halls of Stone (normal mode) requires a minimum of 75. It is possible for 79/80+ toons (depending on class, spec, strategy and gear) to solo access to the Elders in most (if not all) of the dungeons (e.g. the Nexus, Azjol-Nerub, Utgarde Keep, Draktharon Keep in particular). These dungeons are not accessible via the Dungeon Finder Tool for toons 83-85 (though of course 83+ toons can still form their own groups with friends, guildies or on trade channel or solo them). G. The Nexus – Elder Igoshu is standing just to the side of the platform of the crystalline boss Ormorok the Tree Shaper in the Crystalline Grove. A direct route to this Elder (with some trash and no boss encounters) is to turn right after the entrance, follow the hall around till the first right exit into the Crystalline Grove, hug the right wall, pool and trees until reaching the area in front of Ormorok’s platform where you should see the elder. H. Azjol-Nerub - Elder Nurgen is standing across the lake that you fall into after jumping down after the spider boss Hadronax. The watchers and the first boss has to be engaged but it is possible for high enough level toons to run past the second boss and jump down the hole in the web and also to run past the third boss to the exit behind him. I.Utgarde Keep – Elder Jarten is in an alcove to the left after the first short flight of the Njorn Stairs following the first boss, Prince Kadeesh (hug the right wall) and the undead tunnel. It is possible to avoid most mobs, including the first boss to reach the elder though the two forge masters needed to be taken out or at least distracted to get through the flames and the non-elite geists are hard to avoid. J. Draktharon Keep – Elder Kilias is just inside the giant dino boss King Dred’s enclosure. It is possible to skirt Novos if you wish to avoid this encounter by hugging the back (or right) wall though the mobs in the entrance hall need to be dealt with (either directly, stealth or running through and then feigning death, using invisibility etc). K. Gundrak - Elder Ohanzee is on the balcony just behind the second boss, the Drakkari Colossus which may be reached via the Snake boss with one dungeon entrance or past Moorabi by the other. (Ohanzee was in Eck’s enclosure and therefore required heroic mode but was moved to his present postion in 2010 Lunar Festival). L. Utgarde Pinnacle – Elder Chogan’gada is tucked away in an alcove under the broken stairs that connect up the Skadi the Ruthless gauntlet and the antechambers to King Ymiron’s throne room. The first two bosses, Svala Sorrowgrave and Gortok Palehoof can be bypassed but Skadi needs to be defeated to open the door to the stairway. See Kharin’s guide to Utgarde Pinnacle. M. Halls of Stone – Elder Yurauk is in the quarry area to the right (first right at circular room and then take the next right passage and follow it around till you reach the elder) in a slight alcove along the right wall some way before Krystallus (the elemental boss). Stealth and invisibility spells or potions (will need two at least) can be used to bypass the trash or they can be dealt with directly depending on class (eg paladins) or level (85). 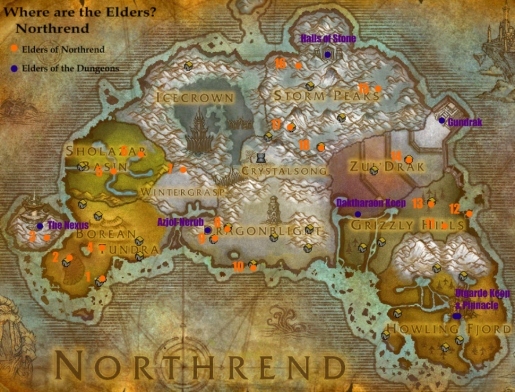 There are 18 elders across Northrend. Their positions are basically unchanged from previous years. The most effiient way to reach them is by flying direct in a rough semi-circle, though it is also possible to use flightpoints and or ride. At least 3 of the elders in Stormpeaks would normally require a flying mount to reach though there ways to over come this including hiring a mount at K3 (77+), hitching a ride with another player with a multi-person mount or using some combination of riding/ghost flying. For more detalis see Flightless in Northrend. As most toons probably have set their hearths to Stormwind or Orgrimmar with the removal of the portals in Dalaran following the Sundering, Borean Tundra would seem the best place to start the circuit. 1. Elder Sardis (59,66) is standing on a rock outside the northeast side of Valliance Keep, directly opposite e the Farsight Lighthouse, Borean Tundra. 2. Elder Pamuya (42, 50) is standing on the northeast edge of Mightstone Quarry overlooking the Zeppelin tower in Warsong Hold, Borean Tundra. 3. Elder Northal (33, 34) is standing within the Transitus Shield in the Coldarra in north-west Borean Tundra. 4. Elder Arp (57, 44) is in the D.H.E.L.T.A encampment in Borean Tundra. 5. Elder Sandrene (50, 64) is standing just south of Lakeside Landing, River’s Heart, Sholazar Basin. 6. Elder Wanikaya (64, 49) is just south of Freya in the Rainspeaker Rapids, northeast, Sholazar Basin. 7. Elder Blueleaf (49, 14) is inside next to the Titan Relic inside the Wintergrasp Fortress, Wintergrasp. To access him your faction needs to have control of the fortress or the doors to the fortress need to be broken down. 8. Elder Morphie (30, 56) is just beyond the colonnade in the southeast side of Star’s Rest, western Dragonblight. 9. Elder Skywarden (35, 48) is on the cliff edge in the southwest corner of Agmar’s Hammer, western Dragonblight. 10. Elder Thoim (49, 78) is at the end of the pier between the two jetties and near the dockmaster at Moa’ki Harbour, southern Dragonblight. 11. Elder Whurain (64, 47) is on the southeast edge of Camp Oneqwah, Grizzley Hills. 12. Elder Lunaro (80, 37) is on the biggest ruined structure on one the islands at the Ruin of Tethys, eastern coast of Grizzley Hills. 13. Elder Beldak (61, 28) is standing amongst the trees on the eastern edge of the Westfall Brigade Encampment, Grizzley Hills. 14. Elder Tauros (59, 57) is standing on the inside edge of the northern part of Zim’Torga, Zul’Drak. 15. Elder Muraco (64, 51) is standing on the road up to Camp Tunka’lo, eastern Stormpeaks. 16.Elder Stonebeard (31, 38) is inside the inn at Bouldercrag’s Refuge in northwest of Stormpeaks. 17. Elder Fargal (30, 74) is on the northwest rim of Frosthold, Stormpeaks. 18. Elder Graymane (41, 84) is behind the Flightmaster just north of K3, Stormpeaks. Dangerous Love and Love is in the Air - Guides on Love is in the Air Festival - coming up in a few weeks! Come One! Come All! Be Amazed at the Wonders of the Darkmoon Faire – the Darkmoon Faire starts the first Sunday of every month. Thanks for the guide – got it done in short notice!